These are frequently seen on either side of the wrist, and are a soft filled noncancerous mass or bump. The frequently arise either from a joint or a tendon sheath. 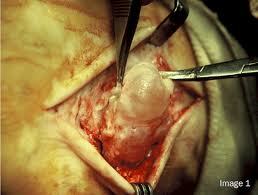 The cyst become painfull at times and may need treatment when this occurs. They can go away on their own but also may change size depending on activities. They may or maynot cause pain. 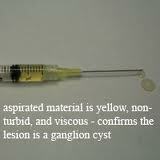 Treatments include anti-inflammatory medicine, aspiration of the cyst, cortisone injections, and surgery. Surgery has a 10% reoccurance rate.